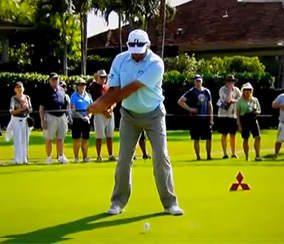 Fred “Boom Boom” Couples is one of the golfers that come to mind when you are looking for an effortless golf swing. 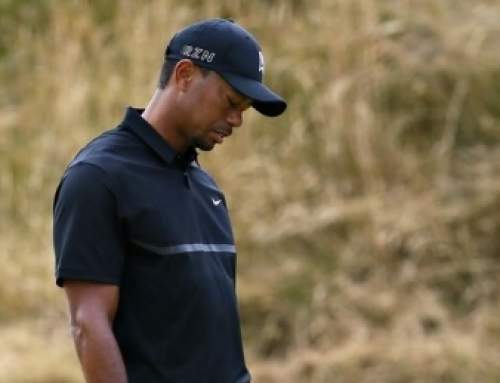 He was inducted into the World Golf Hall of Fame in 2013. He was the world no. 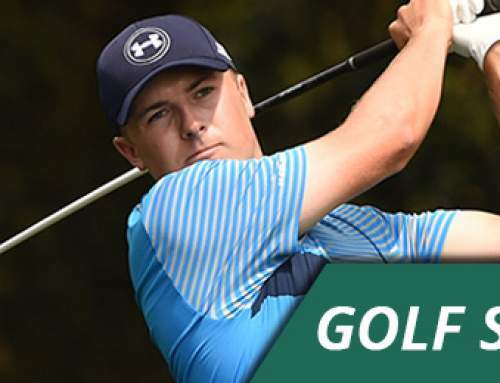 1 golfer for a time with his most notable win at the 1992 Masters Tournament. Fred Couples is one of the very few professional golfers who play without a glove. 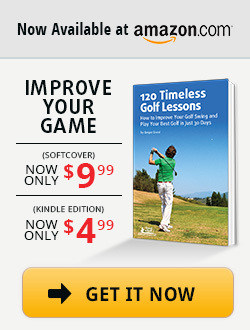 The famous Sam Snead coined the phrase that a golf swing should feel oily. Well, Couples definitely makes it look that way. Let’s take a closer look at his swing! Fred Couples addresses the ball with a textbook setup taking the club back to a parallel position on his takeaway without hinging his wrists. Notice how his upper body is starting to rotate around his very still head as he’s starting to transfer his weight towards his right leg. His left shoulder is starting to rotate under his chin. A good deal of his great tempo and rhythm comes from his footwork. At the top of his back swing Fred Couples lifts his left foot off the ground and forms the famous K-position. He definitely has the looks of a long hitter there. His nickname Boom Boom doesn’t come from nowhere. This shows how important propper footwork is for rhythm and tempo. He doesn’t generate power by brute force but by bringing all parts of his body in perfect synch from the ground up. 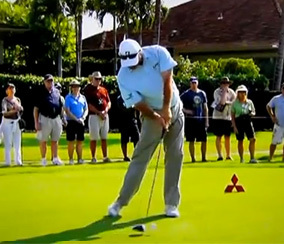 It’s interesting to see that Fred Couples has transferred all of his weight towards his right side way before impact. 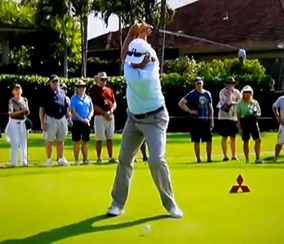 I think this is the main aspect that gives his swing that effortless look. He’s basically in his impact position before his impact position and whips his arms, hands and the club through the golf ball. At impact you can see his rear foot sliding a bit forward. This is another indicator that he has no weight on his right foot at all. Fred Couples on his way to his Finish Postiion. Even during his finish you can see how he’s turning through the ball leading him to facing the target. Take note of his shoulders and arms and how they are turning around his neck. Incorporate proper footwork and weight shift into your swing. 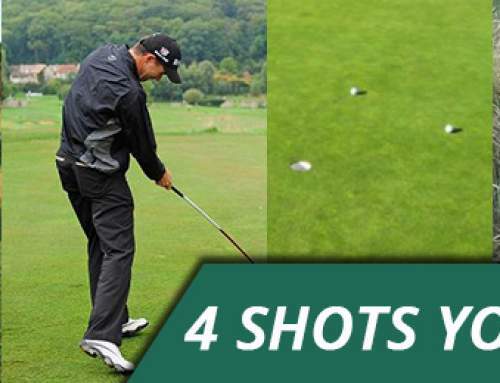 Try to get into your impact position just before impact – whipping through the ball effortlessly. It should feel oily. Stay connected. If you get the feeling of a choppy motion try to get back in synch. 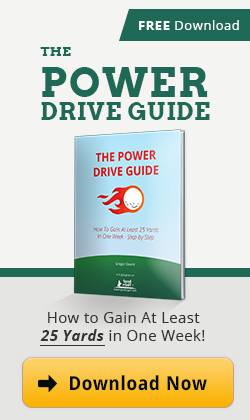 Fred Couples is the perfect example that you can hit it a mile without trying too hard. 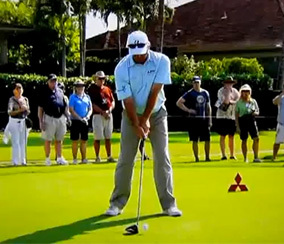 If you focus on your tempo and rhythm for a while you will hit it farther and straighter without tearing a muscle. His swing and tempo is so smooth, it’s like a ski jumper gliding through the air.